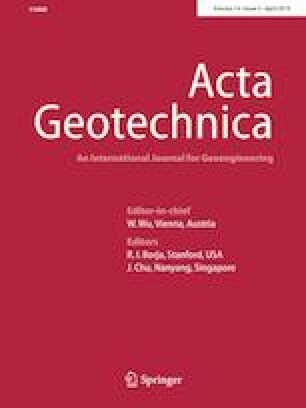 In this work, 3D discrete element method modeling of drained shearing tests with gap-graded soils after internal erosion is carried out based on published experimental results. The erosion in the model is achieved by randomly deleting fine particles, mimicking the salt dissolving process in the experiments. The present model successfully simulates the stress–strain behavior of the physical test by employing the roll resistance and lateral membrane. The case without erosion shows a strain-softening and dilative response, while strain-hardening and contractive response starts to occur as the degree of erosion increases. The dilative to contractive transition is mainly caused by the increase in void ratio due to the loss of fine particles. The change from dilative behavior to contractive behavior is more abrupt for the specimen with larger fine particle percentage because the soil skeleton is mainly controlled by the fine particles instead of by the coarse soil particles. The transition from “fines in sand” to “sand in fines” might be associated with the rapid increasing in the contacts associated with fine particles in the specimen as the percentage of fine content increases. The erosion scenario based on the hydraulic gradient is also modeled by deleting the fine particles based on the ranking of the contact force. Compared with the scenario based on random deletion, the remaining fine particles for the erosion scenario based on the ranking of contact force are more dispersedly distributed, which might benefit the small strain stiffness but result in a smaller strength. This work provides some insights for better understanding the mechanism behind the internal erosion and the associated stress–strain behavior of soil. The gradient of the critical state line increases with more loss of fine particles denoting that the fine particles are helpful for holding the structure of the soils from larger deformation. The authors acknowledge the support provided by the National Natural Science Foundation of China (41772286, 41731283) and thank Itasca for providing the educational loan of PFC3D software. Useful discussions with Sacha Emma and Jason Furtney are also greatly appreciated.